Remaking my profile. Expect better. my alternate account, @s_-c_-r_-a_-t_-c_-h when I want to unless at least 4 people don't want me to otherwise. @24kirshnerj (now @--Accension--) has been UN-banned, apparently. More information to be discovered. 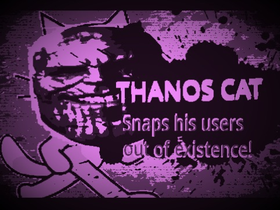 Thanos Cat Joins The Battle!